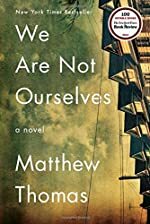 Matthew Thomas's debut novel, We Are Not Ourselves, has been a decade in the making, and is set for release—at last—September 2nd, 2014. The novel chronicles the life and stories of the Leary family, Irish-American immigrants making their way in New York City. I could frame your book as everything from "immigrant story" to "big American Dream novel": In your own words, can you briefly sum up what you think We Are Not Ourselves is about? It's the story of Eileen Tumulty growing up in post-World War II Queens as the only daughter of Irish immigrants and deciding from an early age that she wants a better life than the one she knows. The book chronicles her journey toward that life and the obstacles she encounters on the way, especially in her marriage to her beloved husband Ed Leary. The second half is the story of how Eileen and Ed handle adversity together. I wanted the reader to feel palpably the absence of Ed's point of view, and I hoped to provoke the reader to thought by leaving it out. In omitting such a focal character's point of view, I wanted to capture some of the essence of Ed's own isolating experience of dealing with the calamity that befalls him. There is a sense in which those on the other side of Alzheimer's, even the closest of family members, find the experience of the sufferer inscrutable, almost ineffable. And from a dramatic perspective, I was interested in telling the story of how each of the people closest to Ed, including extended family and friends, responds to Ed's disease in his or her own way. Ed became a fulcrum around which all the characters revolved, and his illness became a backdrop for a series of character studies and explorations into human nature. I tried to take my cues from the characters themselves in presenting a range of possible reactions that might capture the manifold ways people handle bad news. The Irish who live in Rockaway are not the same as those who live in Long Beach, or on Staten Island, or in the Woodlawn section of the Bronx, or in Yonkers, or in Bronxville. And yet they share so many commonalities that they can reasonably be spoken of in the aggregate. I'm interested in the overlaps that lend universality to experiences, because there is something hopeful in thinking of universalities, and I'm also interested in the textures that make experiences distinct. Jackson Heights was a great backdrop for exploring both, as it gathers in one place people from every corner of the globe. On the other hand, I had no particular ambition to write an Irish-American novel, but was writing a novel, period, which happened to focus on Irish-American protagonists. I was thrilled to hear from a Greek reader that he'd seen his father in Big Mike, and from a Montenegran one that he'd seen his grandfather. This book is refreshing in its frank discussions of money, at least in the character's heads. Why do you think it was important to leave calculations of pensions and home equity loans in your novel? I think it makes a book more realistic for there to be discussions of money in it—budgets, plans. This is the stuff of real life. It's what the overwhelming majority of people have to deal with on a daily basis. Not to write about the routine details of people's sometimes difficult financial circumstances is to avoid writing about a crucial aspect of everyday contemporary experience. And money is the last taboo in American life, so frank discussions of money, as long as they don't delve into the most obscure minutiae and leave the reader behind, can create a frisson in the reader perhaps even more potent than the one created when a writer trains the lens on a character's bedroom and intimate life. My favorite scene to write was Eileen saying goodbye to Sergei, the live-in nurse she has gotten close to over the course of the book. It was a scene that unfolded for me in a relatively automatic way after all the work I'd put into constructing that arc of the story, and I just tried to race to get it down as it presented itself to me. One of the underlying plots of Connell's relationship to his father, Ed, is through their shared love of baseball. Why do you think baseball keeps turning up in books that are at some level about the American Dream? I think part of why baseball has long been fodder for American fiction writers, apart from the novelistic feel of a season or the short story feel of an individual game, is that it does indeed bring people together in a common conversation. For years, baseball was a point of entry into American culture for immigrants who found they could share a language with established Americans in the joys and tribulations of fandom. And it was a primer for many males in the performance of the rituals of masculinity, beginning with stickball or little league or the catch with dad, and continuing, the idea went, into one's relationship with one's own child. Baseball fandom became a signifier of one's willingness to assume certain ratified, prescribed male roles. And affections for teams were tribal, and epic in scope. If a girl's father was a Yankees fan, then she was a Yankees fan. That bone-deep identification is fertile territory for fiction, because it activates the most basic impulse of storytelling. This is who I am—a Yankees fan. Speaking of the American Dream: do you think your characters achieved it? I think Eileen does, though I think she looks around and realizes that her experience of what should be the period of her enjoying its fruits is comparatively lonely, until the end of the book, when there is a sense of renewal as Connell imagines his own family to come. I think that without question Ed achieves his version of the American Dream. The ability to do work he appreciates, and do some good with it, all the while not having to worry about defending his national borders or fighting in a civil war—that would be a pretty great dream for a lot of people in the world. And by the end Connell achieves a contemporary version of the Dream: he's employed, he likes his work, he has a bit of self-knowledge, with more perhaps on the way, and he might have escaped the loop of needing ever more (aided by the fact that he's married to a high-powered corporate lawyer, which I hope raises the question of whether it is possible to escape the loop of the American Dream without either succeeding enormously, marrying into it, or stepping out of it via some hard-won and sometimes plain lucky insights into the nature of what's really important in life). The setting of this book is rooted in specific neighborhoods and towns in the New York City metropolitan area. I think I learned more about commutes in Westchester County from reading your book than when actually living there. Why New York City? What is it about that city that prompts so many stories? Writing about New York is attractive because it is almost by definition writing about American cultural life and social history. New York is freighted with so much significance in the American imagination and perhaps the human imagination in general. The city bears the weight of nearly limitless thematic importance as a symbol of capitalism, immigrant opportunity, decadence, urban decay and renewal, race and class relations, and inequities in the distribution of resources. It's an enormous and enjoyable challenge (enjoyable perhaps because of its inherent impossibility) to try to capture in a book some of the uncapturable spirit of New York. While we're on the subject, what is your favorite place in New York City? Carl Schurz Park on the Upper East Side is my favorite place to sit and listen to the rhythm of the city in concert with the natural world that persists unbowed alongside life in the city. And Paragraph, a workspace for writers on 14th Street in Manhattan, where I wrote a good portion of my book, is a lovely refuge that is quieter than any library, though there's a kitchen area if you're craving human interaction or a cup of tea. This being your debut novel, what is it like, gearing up to sell a book for the first time? It's exciting to think of it being out in the world and having a life of its own. Every day I'm grateful that it's getting published and will have a readership. Some of the books I've read and enjoyed recently are Cloud Atlas, The Orphan Master's Son, Tobias Wolff's Old School, The Sense of an Ending, The Reluctant Fundamentalist, Redeployment, Someone, The Mezzanine, The Pale King, The Prime of Miss Jean Brodie, and Eddie Joyce's terrific upcoming novel about Staten Island, Small Mercies. What is your own library like? What kinds of books would we find on your shelves? In the last year, my wife and I and our twins moved from a one-bedroom apartment into a house, and it's a pleasure to have all my books in one place instead of in storage. On the shelves I have a lot of the usual suspects, mostly fiction. Everybody ends up having so many of the same books on the shelf, don't they? I have books from college courses. There are art books. I have a large collection of books of poetry; for years I was a big reader of poetry. And there are a few books by the genius cartoonist Tom Tomorrow, as well as R. Crumb's illustrated Book of Genesis. I'm betting your autumn is going to be filled with some book tours and publicity, but what is next for you? Have you already started on another book? I'm writing a novel about a different kind of family from the one in my first book. It, too, is rooted in the lives of its characters. I don't intend to spend ten years writing it, that's for sure. But who knows? We can only control so much in life.